The Red Panda is a small & secretive mammal that is native to the Himalayas - it ranges from the foothills of western Nepal to parts of eastern China. It is estimated that less than 10,000 mature individuals remain in the wild and therefore it comes to no surprise that they are classed as endangered. They are threatened by habitat loss, poaching and inbreeding depression. They can rotate their ankles to walk down trees. As they spend so much time up trees, it becomes essential for them to come back down, therefore they have adapted themselves to rotate their ankles outwards to give their claws better grip. 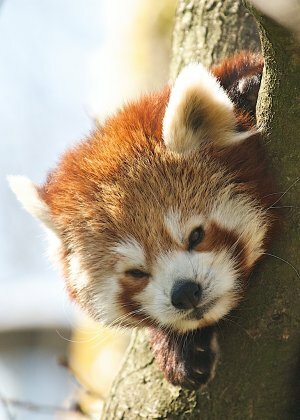 The Red Panda is the only species of its kind. Discovered in 1821, 50 years before the Giant Panda, common assumptions are made that they are closely related but in fact, the Giant Panda got its name because of the Red Panda's similarity in anatomical features. 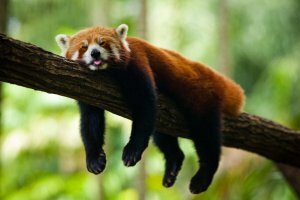 Red Pandas are nocturnal. They spend most of their days slumbering in the tree tops using their tails as pillows. They are usually solitary creatures and spend most of their energy foraging for food (bamboo mainly). The Thumbs up. 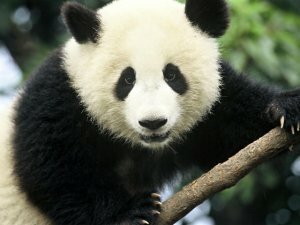 Both types of Panda have special wrist bones that can be used as a thumb which helps them eat bamboo. Why are they so special? They are elusive, biologically unique and their existence is so important to our planet's natural heritage and global biodiversity. We're extremely lucky at Drusillas to home 2 lovely adults. Mark Kenward our Head Keeper, is very close with these animals and has been looking after them since their move last Easter. He monitors them everyday and has forged a great relationship with them - the pandas know Mark and trust him fully. So everything is well within the panda world at Drusillas, and who knows, things may just get a little better!